Juicing cucumbers and watermelon together makes a delicious super-hydrating drink. The best hydrating foods are primarily raw fruits and vegetables. Most produce naturally contains high levels of water, as well as enzymes, essential vitamins and minerals, antioxidants and phytonutrients. The general rule of thumb is that we can get about 20% of our daily intake of fluids from food. However, this is only true if we are consuming several servings of raw fruits and vegetables daily. If our diet consists primarily of high protein, high fiber, processed foods, we will be getting little hydration from our food. No matter how you eat, it is still important to be drinking enough water on a daily to stay hydrated. The foods that have the highest water content are naturally going to be more hydrating. However, the mineral content of the food is also a key factor in how hydrating the food will be. The most essential minerals for hydration are sodium and potassium. Thus, the foods with the highest water content which also have a fair amount of these minerals will usually be the most hydrating. Why is this? Even though water itself regulates the water content inside our cells, once the water gets into the cells, what holds it there is potassium. Sodium’s role, then, is to keep some water outside the cells. According to Dr. Batmanghelidj, author of Your Body’s Many Cries for Water, this happens because of salt’s natural osmotic retention of water. We have chosen the following 10 as the best hydrating foods, not only for their water content but also the their content of hydrating minerals and other nutrients. For example, even though iceberg lettuce has 96% water content, it has low nutrient value and thus it did not make it on our list. Watermelon – 92% water content. According to a research study from the University of Aberdeen, watermelon was the best hydrating food because of its high content of both water and minerals. In addition to its high water content, watermelon contains about 85% sugar and a variety of mineral salts, including sodium, potassium and magnesium, which are essential for hydration. Cucumber – 96% water content. Cucumbers have the highest water content of all, just not quite as much sodium and potassium as watermelon does. Cucumber is my favorite salad ingredient but it is also excellent for juicing. 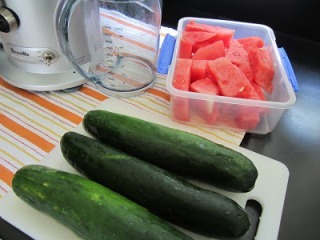 In fact, juicing cucumbers and watermelon together is one of the healthiest hydrating beverages you can drink. It makes an excellent alternative to Gatorade or Powerade since the juice is so hydrating and the mineral content will help restore the body’s electrolyte balance both during and after exercise. Celery – 95% water content. Celery is a nutrient-dense food - low in calories (6 calories per stalk) and high in nutrients (including vitamins A, C, K and folate). Celery juice is often recommended as a natural remedy for certain types of acid reflux and heartburn because it can neutralize stomach acid. Radish – 95% water content. The radish is considered a cooling food and is thus an excellent snack to munch on or add to salads during hot weather. They are also high in antioxidants and provide a distinct flavor to food. Tomato – 94% water content. All types of tomatoes have a high water content, and they are always a staple ingredient in sandwiches, salads, and sauces. The small cherry and grape tomatoes can be a refreshing, summer hydrating snack. Tomatoes are one of the highest sources of lycopene, an important antioxidant found in red fruits and vegetables. Green bell pepper – 94% water content. Green peppers are nutrient packed with vitamina A, B2, B6, C, E, pantothenic acid, niacin and potassium, which increases their hydration benefit. Red and yellow bell peppers are also highly nutritious and have about 92% water content. Cauliflower – 92% water content. one serving of cauliflower contains 77 percent of the recommended daily value of vitamin C. It's also a good source of potassium, manganese, phosphorous, fiber and a full spectrum of B vitamins. However, I believe cruciferous vegetables (such as cauliflower and broccoli) should always be cooked (at least lightly steamed) before easting because they contain chemicals that can potentially block the production of thyroid hormone in the body. Broccoli – 91% water content. Broccoli is well-known for its anti-cancer properties. Adding lightly steamed broccoli to salads provides a satisfying crunch to any salad. In addition, it is a good source of potassium, copper and phosphorous, dietary fiber, and vitamins A, B, and E.
Strawberry – 91% water content. Even though the strawberry has the highest water content of the berries, all berries are hydrating and highly nutritious, especially in vitamin C and polyphenols. Unfortunately, studies have shown that 98% of all strawberries in the U.S. tested positive for residue of at least one pesticide, according to the Environmental Working Group (EWG). In the 2017 EWG report (see “Dirty Dozen” below), a single sample of strawberries showed 20 different pesticides. Thus, I only buy organic strawberries. Spinach – 91% water content. Spinach is also rich in potassium, folate and vitamin E, as well as other nutrients. Raw spinach contains a chemical called oxalic acid, which can be irritating to the mouth and intestines. In addition, oxalic acid blocks iron and calcium absorption and may contribute to kidney stones. Thus, I am not a fan of raw spinach salads. However, oxalic acid can be reduced or eliminated by light steaming or cooking to enjoy the full hydrating and nutrient benefits of spinach. Unfortunately, half of the most hydrating foods listed above are also part of the Environmental Group’s 2017 list of the “Dirty Dozen.” These are the most pesticide-laden produce. Thus, we highly recommend choosing organic (if possible) when buying these super hydrating fruits and vegetables. In most cases, even a produce wash will not remove the pesticides because they are oil-based. The produce wash would have to contain an emulsifier to remove the oil-based chemicals—and I have yet to find one. Saga.co.uk: 10 of the Most Hydrating Foods; 2016. Health.com: 15 Foods that Help You Stay Hydrated; 2017.